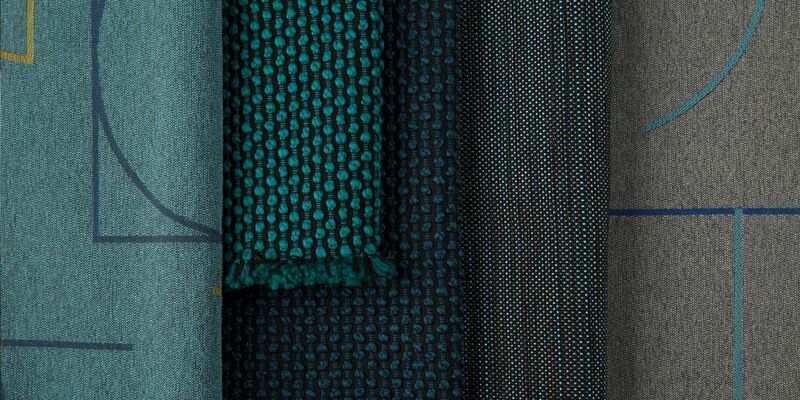 Luum Textiles today announced the launch of its latest textiles collection – Focus In – at NeoCon, the commercial design industry’s premier event, June 12-14, at The Mart in Chicago. As technology continues to redefine the way we engage, think and feel about interior spaces, traditional modes of interaction in offices, schools and hotels are being transformed through new tools that enable rapid communication. Outpress, Knurl and Amalgam are distinct upholstery fabrics that embody both high-performance and comfort. The multi-tasking textures of Navigate and Heather Felt offer more options to design seamless, transitional spaces when applied as both seating and vertical surfaces. Technoplaid, a wrapped-wall product, and Mica Shift, a direct-glue product, provide the opportunity for a dramatic focal point through the use of tape and metallic yarns. Outpress’s curvilinear accent lines join and split across fields of heathered yarns evoking architectural structures. Knurl is a textural upholstery fabric. The straightforward weave structure allows thick, knubby rows of polyester yarns to shine. The exaggerated texture provides opportunities to create visual interest through texture and color. Amalgam is woven with fibers that are also used in footwear. The multi-colored, marled yarns are tightly woven, embodying the hybridization of high-end and performance qualities typically required in sportswear. The embroidered Navigate pattern is a marriage of hand and machine processes. A fine, stitched line subtly fades in and out across a variegated ground capturing the spirit of a fluid and active environment. Navigate addresses the need for sound-absorbing materials by using Heather Felt as its base cloth. Heather Felt is a classic, 100 percent wool felted construction with a supple hand and variegated, heathered appearance. Darker, moodier color palettes typically seen in hospitality settings are moving into the workplace to provide spaces of respite and comfort. Addressing this need, Technoplaid is a contemporary, large-scale plaid, with a metallic accent fiber, for use as wrapped wall and panel. Utilizing a lustrous tape yarn, Mica Shift brings new light into a space through a textural weave. The tape yarn floats against a matte ground weave offered in bright whites, warm neutrals and cool silvers. Joining the group of vertical fabrics incorporating tape yarns, this direct-glue product adds an organic yet technical element to an interior. Visit Luum Textiles’ showroom #1043 during NeoCon.